I hope y'all have had an amazing long weekend! Y'all know how much I love coordinating outfits with Madeline. I adore a good red, white and blue look. Pairing together pieces for a patriotic outfit is something I always enjoy. This look is perfect for all summer long and especially for the patriotic holidays. I immediately fell in love with this top when I saw it. The smocked details, the bell sleeves and especially the red, white and blue make it absolutely adorable. This straw bag is also too adorable for words! I absolutely love it and will be taking it along to the beach for sure. What I love even more is that it has a drawstring closure so that you can actually keep your things safely inside without falling out. It also comes in black and pink. Madeline loved it! When we were taking these pictures, she took it from me and said it was hers :) It is a bit smaller than the straw totes I normally carry around, so I can see how she would think that. I guess I better get used to her taking my things haha. And now on to more important things, I just want to express how grateful I am for those who have fought for our freedom. I have several family members who have served and friends who have (and are) serving. I think about all the brave men and women who have gone before us and served in defense of our country. I just want to say thank you from the bottom of my heart. Thank you for protecting us. I love the reminder of our country being the "Land of the Free, Because of the Brave." I could never begin to express my gratitude to the ones who have paid the ultimate sacrifice for our freedom. Happy Shopping :) Thanks for stopping by! Happy Friday, Y'all!! 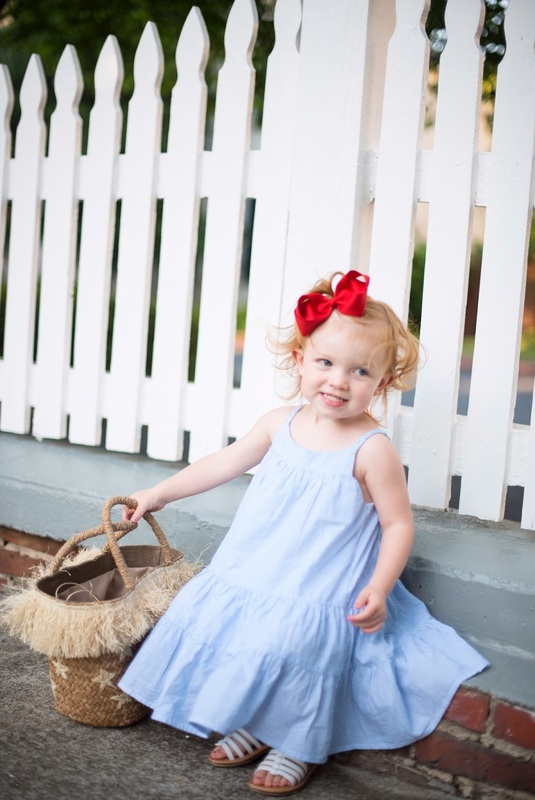 I'm so excited that it's Memorial Day weekend, and I'm positive that I'm not the only one :) Today's post is all about the cutest little navy eyelet sundress. I usually save the pricing details for the end of the post, but this time, it deserves to be mentioned at the beginning. So, RUN DON'T WALK...this darling little dress is on sale for $23, regularly $138!!! Yes, you read that correctly...JUST $23! That's over $100 off!! I'm so bummed that I didn't catch it on sale, but at the same time, I'm so glad to style this just in time for y'all to catch the sale. I also want to mention that the Nordstrom Half Yearly Sale has begun! This is an incredible sale with some amazing pieces you don't want to miss. The deals are amazing and will have you prepared for all your summer plans. I'm listing a few of my favorite pieces, including several that y'all have seen me wear on here recently, in the widget below. My Easter Dress, this top, these sandals and these sunglasses are all included in the sale and are all under $100!! 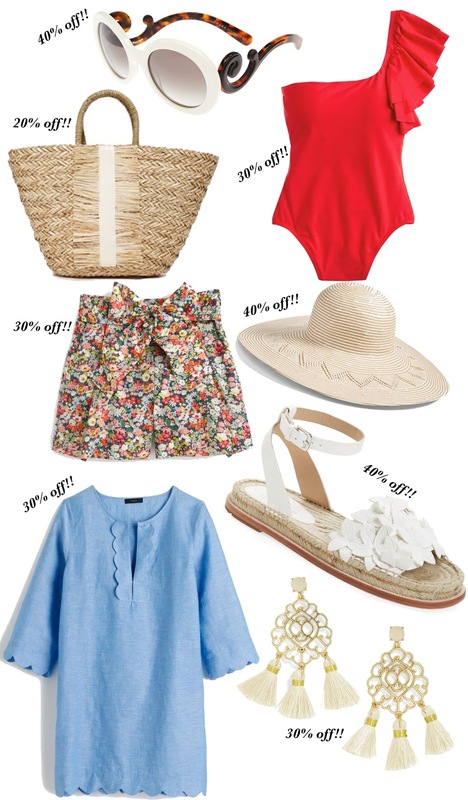 There are so many great sales beginning for Memorial Day, and I'll be sharing more details in tomorrow's post. Have an amazing start to your MDW! Happy Wednesday, Friends! Today I'm so excited to share the details on a dress that I have been enjoying way too much ever since it became a member of my closet. This Blue and white stripe OTS dress is simply perfection! Y'all may laugh at one of the main reasons I'm loving it haha. But first, I just have to elaborate on how adorable it is. 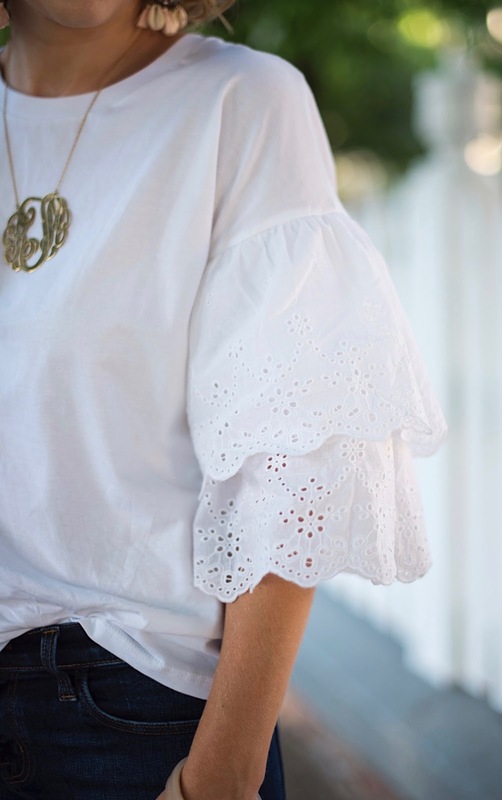 The tiered ruffles give off such a feminine silhouette that I simply adore! I can't seem to get enough of blue and white recently. It's such a refreshing color combination that seems to be the perfect match for the hot weather. It's simplistic yet such a statement! And of course, I love the ruffles. Need I say more? 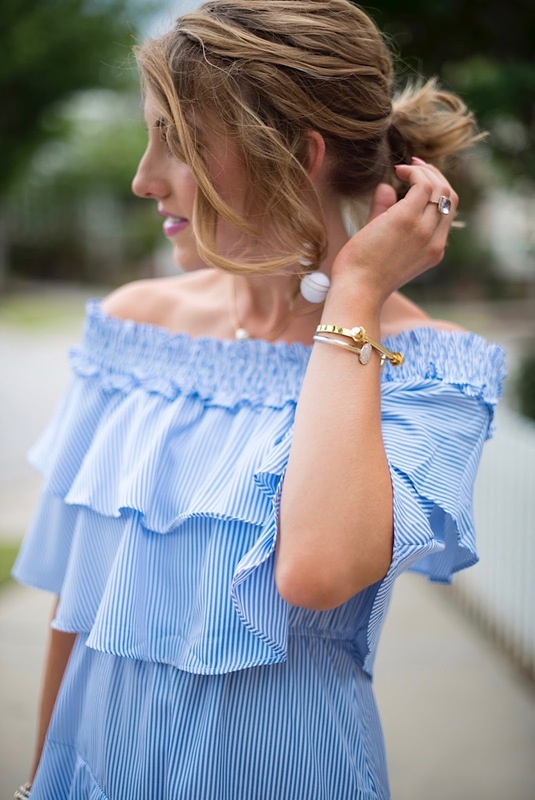 I'm a ruffle junkie and these ruffles are absolute perfection. Are y'all ready to hear one of the main reasons I'm loving this dress? Well it is an OTS piece that actually stays off the shoulders. I become so annoyed when I'm constantly having to adjust my OTS pieces to keep them off my shoulders. And handling such pieces is no match for a mama trying to chase a toddler around haha. Anyways, this dress stays in place...no adjusting it in any way! I wore it to a celebratory dinner last week it was the perfect piece to dress up for the occasion. Lastly, It's only $46. 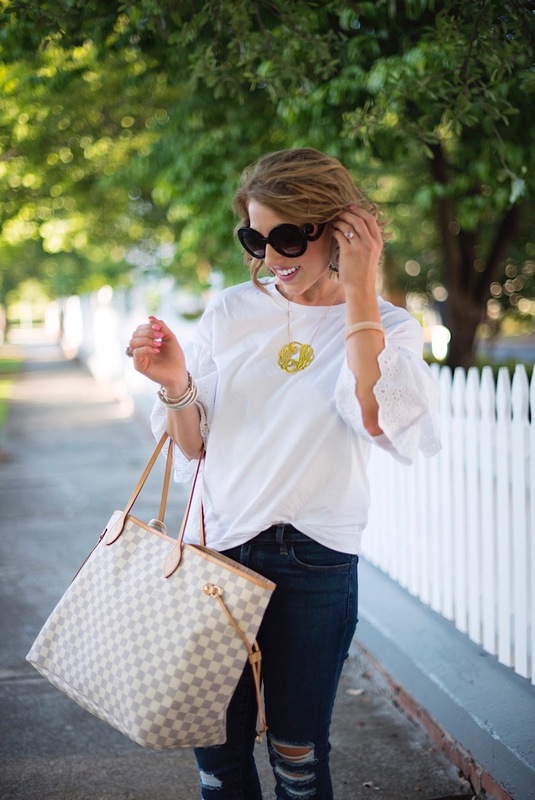 Have I convinced you that you need this piece in your closet yet? :) For sizing details, it runs true to size (wearing a US size 2 for reference). Happy Saturday, Friends! 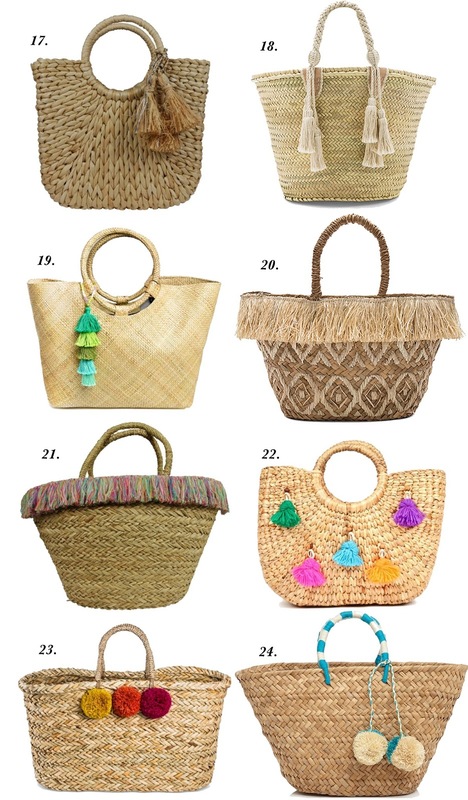 To me, nothing screams summer like the perfect straw bag. If y'all haven't already noticed, they are becoming quite the trend :) Above are TWENTY-FOUR amazing choices. All I have to say is, I'll take one of each, please! 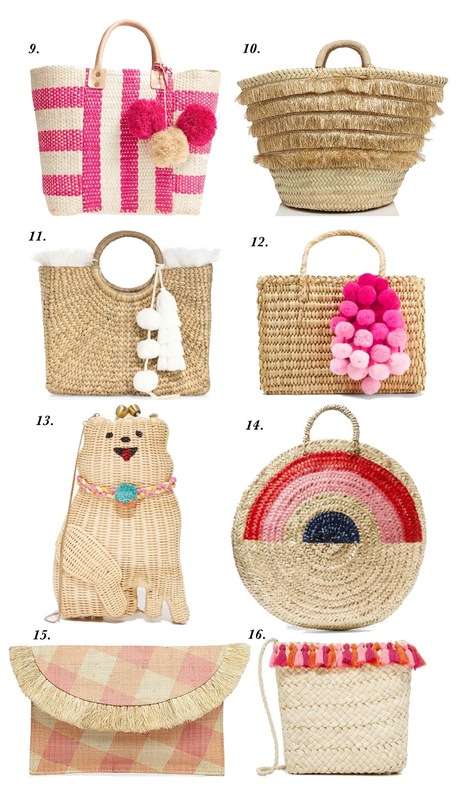 But seriously, I never knew a straw bag could have so much character. 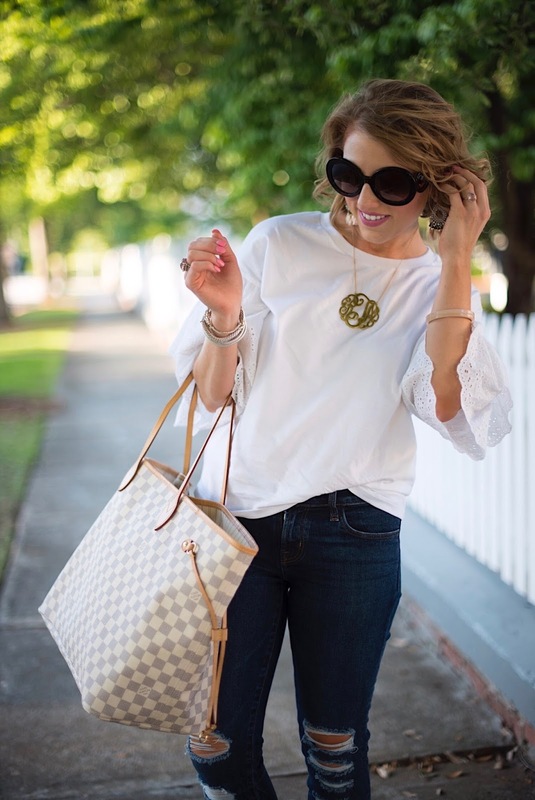 If you're off to the beach, have plans to be lounging around the pool, or just need a refreshing accessory to help with the heat of summer, you need a straw bag in your life! I think I actually have a problem because I have begun to collect too many haha. I own six (oops) of the ones pictured above (1, 3, 5, 6, 10 and 12). My larger ones, like number 6 for example, are perfect for a day at the pool or the beach. 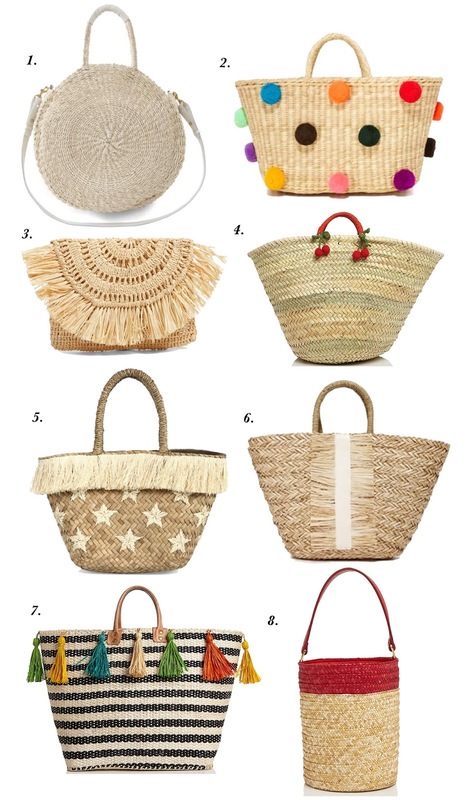 #1 is probably my go-to straw bag because it's perfect for everyday running around. Not to mention it is absolutely adorable!!! It looks like it was just restocked, and trust me, it won't remain in stock for long! I also want to point out a few others that are too cute to pass up. Who knew there was such a thing as straw gingham?! I certainly didn't until I laid eyes on this DARLING clutch! How adorable is #4 with the little cherries?! And don't get me started on the shell details on #22. I know I'm crazy haha, but I'm actually trying to decide on one more to add to my collection. The choices are 11, 17 or 22. Which do y'all love best?! I'm also obsessing over this one. It's adorable, under $50 AND it has a zipper!! !